Both acts on this bill hail from the Western side of the United States, yet they honoured Vancouver in their own ways. This show marked the first time L.A.-based opener Phoebe Bridgers ever ventured north of the border. After regrettably expressing the tired opinion that our money is weird, she made up for it by dropping an unexpected cover of "The House That Heaven Built" by Vancouver's own Japandroids, delivered downtempo with just her acoustic guitar and stunningly sweet, folksy vocals, and a minimal drum accompaniment. Given that Ryan Adams, who produced her Killer seven-inch, has called Bridgers a "musical unicorn," her obvious talent deserved more attention from the incessantly chatty crowd of social butterflies. 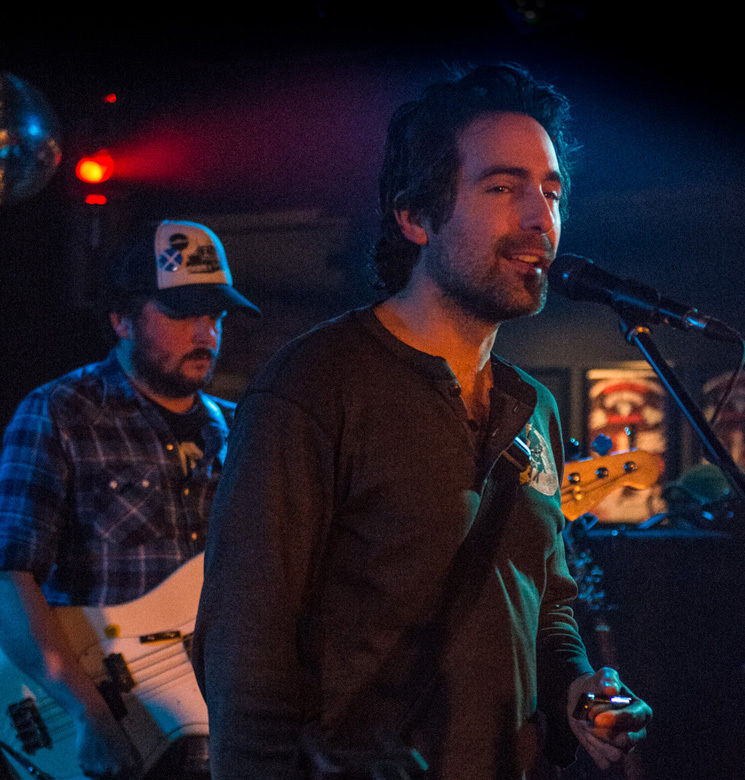 Portland's Blitzen Trapper literally wore their appreciation for Vancouver on their sleeve thanks to the appearance of Erik Menteer, who sported a brilliant vintage Expo '86 ringer T-shirt that would rightfully earn any owner many rounds of free drinks in this city, though his performance was worth much more than that. Not that he was particularly flashy; none of them were, really. They were all just right on, solid as a brick from the booming rhythm section of drummer Brian Adrian Koch and bassist Michael Van Pelt forward through fierce lead guitarist Menteer, passionate keyboardist Marty Marquis, and gravelly voiced guitarist/frontman Eric Earley. With a Cascadian flag draped over Marquis's keyboard and an old Oregon state beaver flag under a Moog near Menteer, there was a celebratory feeling in the air for Blitzen Trapper as they capped off yet another tour, completing a West coast swing with Bridgers at the Biltmore after heading across the States with the Domestics for all of October. Indeed, since the end of September, they have been All Across This Land, as the title of their 2015 album stated. Midway through the set, Koch had to jump on the mic just to say how much fun he was having. They maintained a professional flow with crisp changes and rich dynamics throughout their hour-and-a-half set. They delivered all the smaller moments with a natural grace, like their encore cover of "If I Needed You" by Townes Van Zandt, where Earley played acoustic guitar while Marquis and Koch stood at their stations to support his vocal harmonies, or their version of "Furr," in which Menteer played tambourine and raised a beer to the crowd as they belted out all the words. Yet, they clearly had the talent to go off-script. Menteer and Earley got into a gentlemanly electric guitar battle during "Rock and Roll (Was Made for You)," but the most impressive turn came during "Thirsty Man" from their VII album. The song itself was much heavier than on record, ramping up a righteous '70s stadium rock vibe while progressing their solos much further in a lengthy, textured jam that eventually landed perfectly on a bodacious cover of "Come Together" by the Beatles. This was one of the few moments where it felt like they indulged themselves, and they easily could have gotten away with much more. The first time I saw Blitzen Trapper live, they were opening for Two Gallants at the Media Club back in 2007, having just been signed to Sub Pop. Since then, they've lost a member and most of their lo-fi indie edge, replaced by an increasingly slicker take on '70s/'80s throwback rock drenched in evocative Americana storytelling and what Earley would describe as "hillbilly gangster" attitude, becoming something that's equal parts Springsteen, Skynyrd, Cass McCombs and Drive-By Truckers. Over the course of many years, they've gone from opening a shoebox to selling out the Biltmore, and leaving them wanting more. It's a long way to the top, and they're making the trip.